The saga of the Galaxy S 4 inventory delay continues as T-Mobile’s @tmobilehelp Twitter account has dropped word on the new in-store availability for the flagship smartphone. Pushing things back from May 1st to May 8th, the Galaxy S 4 will start off available at “select” stores two weeks from today and expand to nationwide availability at all of T-Mobile’s retail locations on May 15th. Samsung’s inventory problems have already caused delays for at least two national carriers, and is likely the reason Verizon has decided not to launch the device until May 30th, well behind its rivals. So there, now you have your in-store Galaxy S 4 availability date, but I’d suggest penciling it on your calendar just in case. hahaha MORE $$ than the One? Samsung is smoking some special stuff. The GS4 Wil have Better resale value than the One, and is backed up by a better company that is sure to receive the next 3 or 4 versions of Android, can you say the same for any HTC phone? Has there ever been an HTC phone that received more than one update on any given carrier? I don’t think so. Resale value? Once they subsidize this phone on every carrier it will be affordable for everyone. They did it with the S3/Note II and they will do it with the S4/Note III. Samsung wants to sell as many phones as humanly possible. That is just how it works. You must not understand what resale value is, do you own an HTC One S? If you tried to sell it to the same people that I am trying sell a Galaxy S3 to, they would not only rather have the GS3, they would pay more for it too. true, i dont even think i could sell my One s for $100 at the very least. The sale of a thing previously bought. The sale of goods to the public for use or consumption rather than for resale. I’m talking about OS updates, not bug fixes, it don’t surprise me that you have had that many updates to quash all the bugs Sense comes with. i downloaded jelly bean today. Samsung has now become a brand name in smartphones and they feel they can charge an extra premium for the same/similar product. This is like the 5th post of someone being “shocked” at the price. Again, I will say, Did no one do the math on the $149.99 down and 24 payments of $20? The price is nothing new. 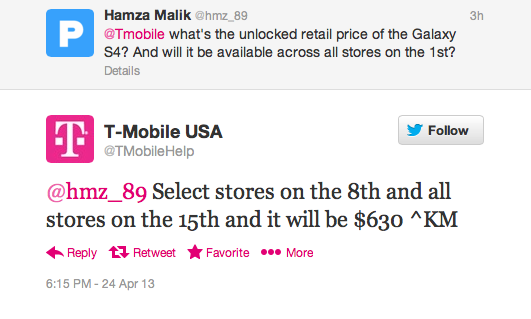 In fact, the total cost is in the first line of the fine print on T-Mobile’s GS4 landing page. Also, people are complaining that this will be in the highest tier for insurance. Yes, it will be, but don’t pay for what you can get for free. In all fairness you don’t need the highest level of insurance ($11.99). The mid range ($7.79) offers extended warranty coverage, plus lost, stolen and damaged. The highest tier only adds mobile security. There’s a free app in the play store (Cerebrus) which is an even better service and can be transferred to future Android devices. It will geo locate your phone, send you an email with picture if the wrong pin is used, send you an email if someone tries to swap out the sim. It will send you a pic on command from it’s website, sound an alarm, wipe the SD card and memory All for free. That saves you $76.80 over 24 months – well more really since you never have to purchase the top tier again. And I agree with IRIE4IPIER, the GS4 will be updated beyond Key Lime pie and resale value will remain high. Why do you keep reposting this? Like 5 times today. Stop. Must be a Disque issue. My apologies. Well now we know. Thanks Dav. danm how much bad news i can take in one day? f************k.
Dam so hard to choose between this and the htc one. I agree. I’m contemplating to get the HTC One instead of the S4. I agree but I think I will be going with the s3. I had pure htc phones my whole life I will be trying samsung for the first time hopefully everything works out good. Whoa Whoa Whoa.. 630 will put this phone in the highest tier for deductibles! This is not the NOTE 2 T-Mobile. Did no one do the math on the $149.99 down and 24 payments of $20? The price is nothing new. I pay 7.99 I believe for mine which is the insurance and warranty combined on my gs2. You saying if I get the GS4, then my monthly insurance fee will go up? Ok but here is the point. The NOTE 2 has been the only device who is in that tier. So the GS3 is not in that tier, yet the GS4 will? This is just a way to get even more money. The deductible of the GS4 would be more money then the down payment of the phone. I really hope this is wrong. In all fairness you don’t need the highest level of insurance ($11.99). The mid range ($7.79) offers extended warranty coverage, plus lost, stolen and damaged. The highest tier only adds mobile security. There’s a free app in the play store (Cerebrus) which is an even better service and can be transferred to future Android devices. Again, we’ve know the price for a while now. And the specs of the S4 are much better than the S3, more hardware. Easily, yes. The Note 2 was a $700 phone. Actually, the original Note is in the tier too. Yes and from what I understand, all of the upcoming flagship devices will be a part of the higher tier (Tier E $11.99). HTC One and GS4 will be up there with iPhone 5 & Note 2. I did the math on the 20×24 plus the 201.00 down payment and its more than 630.00?? Why are you putting $201 down? Um, really? Taxes are paid to the government, it has nothing to do with T mobiles retail cost. They are charging you 149.99+(20*24)=$629. I’m not quite sure what you don’t understand here. Yes, it would cost you $200. T-Mobile is charging you $150. Your state government is charging you $50. State taxes ARE NOT a part of T-mobile’s retail price. If you bought a shirt listed at $10 and paid $10.83 at checkout, the store is not keeping your $.83, it’s passed on to the state. Not true in states that don’t have sales tax. Why I said if purchased here in my city.. I would if I knew the exact day it was launching online because at this point I have no idea anymore.. Can anyone confirm the 29th still being D day for online pre-orders? Yeah it looks like it will be the 29th. Two comments below the OP stated $149.99 plus tax for his area is $201. Oh right, I thought he was talking about pre-ordering online. My mistake. If the company has a local retial store in your state, they still charge you the sales tax. My order came out to the same, $201 after taxes. Waiting for the Google I/O Event here in SF in May anyway, hopefully at least some info on the next Nexus device even if it won’t be out this year. For those of you wanting the One, take this from an HTC One S user. Yes, their build quality is better, I prefer my camera over the S3 and Note 2 and you can have your preference on Sense or Touchwiz. Take this as reference though, Samsung has kicked down Jellybean via Kies to the S2, a way older phone than my One S and I’m still waiting for it…. And depending on your media use after having a phone with no sd card slot I prefer going back, even with 32gb I wouldn’t feel safe. If you would like to have expedient updates to all of the latest android versions to come, which in my opinion makes your phone experience the most important. Go with Samsung. HTC has a record of not updating their phones as fast as Samsung. Thank you. Except HTC updated my old T-Bolt to ICS and Samsung couldn’t even update their Droid Charge(which was newer). That Droid Charge was never updated because Verizon chose not to update it, Samsung updates most if not all their phones minus a few rare cases like the Charge. I had the HTC amaze and I agree. The Amaze camera and build owned the GS2 but ended up switching to the GS2 in the end. As a ONE S owner, you also understand the BUGSSS that HTC phones have. Those little annoying issues. Just so you’ll know kk….that is not a common issue. I still have my Sensation as my daily driver…and I have never had WiFi issues. It has been a fantastic device. I had to get three Sensations in order to get one that had fully functioning Wi-fi. The Wi-fi issues were known with the Desire, Sensation and the Amaze. I feel your frustration, but this is a new sense, which is totally different from the previous generation of sense. well, but keep in mind that it is a new Sense. Who knows what issues will come up later on. I have had HTC phones before. They all have a propensity to work ok for a few months and then start having issues. Deon, people said the same thing with Sense 4. This song is getting tired now and I’m not falling for it. I cannot agree more. I have a HTC Amaze and I cannot begin to list down the issues I have. Bluetooth, Wi Fi etc. And since the past 2 weeks even my dialers stopped working. It takes 5 mins for a dialled number to actually become a call. I love they way the HTC One looks but after my experience with the Amaze, I’d probably go with the GS4. HTC don’t even update some phones at all, I don’t know where you’ve been but haven’t you heard that the HTC One X will not receive any further updates, so if that phone won’t be receiving any updates, what makes you think the One s well get any updates? I can’t believe Samsung even considered updating the Galaxy S2 to jellybean being that it’s older than hell. The One X and One S just came out last year. Samsung definitely has a better track record than HTC across the board. HTC updates stuff all the time. Take a look at their phones over seas. The HTC One international has been updated already a few times. T-mobile has to approve the update before it goes out. If you want updates use the Dev sites to get them. I couldn’t agree more. So much of a devices update schedule depends on the carrier. I’ve been running 4.1.2 and 4.2.2 on my AT&T GS3 for months. Good things come to those who wait. BTW the One S wasn’t a flagship the One X was. And the international One S was updated way before the T-Mobile variant. Don’t act like it’s HTC’s fault. not to mention that their latest “flagship” phone (HTC ONE) doesn’t even come with the latest build of the Android OS. that in itself should say something. No offense Daniel….but you are actually 100% wrong about how fast HTC updates their devices. There is an actual study on how fast manufacturers have released updates…..and guess what….HTC is the best at releasing updates across their portfolio….yes…#1 across all manufacturers. Sure, some devices have been slower than others to get updates, but you simply can no longer just say HTC is slower than Sammy. Facts don’t support that claim anymore. Maybe 2-3 years ago….but not for a while my friend. Your frustration should be with Tmobile, as its up to each carrier to release the updates they receive from manufacturers. Sorry…this was supposed to be a reply to Daniels first comment up top. I just want to make sure misinformation isn’t being spread. For someone that owns the One I’m not sure why you even bothered to keep it with so many issues? I am contrary because I bought into Samsung with the Vibrant and was let down with issues, 5 replacements and extremely delayed updates. On the flip side I bought my Amaze, a week into it I washed it and dried it, bought a battery, worked PERFECTLY after that huge mistake. If you want updates you get a Nexus or you tinker with ROMs, but you don’t depend on a carrier device to update. Is online still the 29th? WTF! seriously another week!? This is just ridiculous now, Samsung! get your sh*t together! My HTC MyTouch 4G can’t handle much more, I’m lucky if it makes it 4 hours on the lowest possible settings and DOESN’T shut down for no reason then turn back on with <2% battery!!! HTC Mytouch 4g! I’m still on life support with my Samsung Vibrant….. It really doesn’t matter how long it takes to get it started, they just need to make sure they have enough when they do get it. Don’t post is, then a week later list it as out of stock. If you order online on 29th, will it get shipped soon after? Or only after it becomes available in stores? If your order is completely processed before the 5pm shipping cutoff, you can have it as soon as next day. Hopefully they don’t ship USPS, or they just leave boxes by the door. T-Mobile usually ships though UPS with signature required. Thankfully, UPS also offers to have you package held at either a retail location (UPS Store) or one of their distribution centers for free. Packages will be held for 1 week. Everything still looks good for Monday. Fingers crossed. I don’t even want this phone. I’m still using my HD2. I just want a 8x, and they no longer sell them. You guys think you have it that bad! huh think again I have the Samsung Vibrant, almost 3 yrs old, the phone is on it’s last leg,battery drain,constant LAG,it has a mind of it’s own, and the bad part about my B-day is tomorrow now I have to wait another 10 days smh ugh….. I guess now they will get a full months use out of the “New smartphones just $99 down” signs. I alerted David to this twitter post last night after digging through T mobiles twitter accounts. I’m a little miffed they haven’t bothered to issue a real press release. If I hadn’t been bored at work who knows when we’d get word. If you want my money, please keep me in the loop. the guy at the tmobile store said that select stores will be getting it on the 1st of may… I hope he’s right, but I doubt it.. So everything is still on for tomorrow…? I’m waking up bright and early to be sure and get my hands on one.